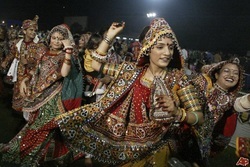 Garba : Garba is customarily performed by women, the dance involves circular patterns of movement and rhythmic clapping. It popularly performed during Navratri. The word comes from "garbha deep" which is translated as either light in the inner sanctum of the temple or lamp inside a perforated earthen pot (which is often used in the dance). Padhar: It is performed by a rural community living around NalLake. In it, performers simulate the rhythmic movements of roving mariners and the undulating sea waves. The Bhil tribes, who live close to border tracts, and the Adivasis of Dangs district, have particularly lively folk dances. Raas: Raas is an energetic, vibrant dance originating in the state of Gujarat. Often called the "stick dance" because it uses polished sticks or dandiya, it represents a mock-fight between Durga and Mahishasura, the mighty demon-king. It is nicknamed "The Sword Dance" because the dandiya represent the sword of Durga and are hit together. The combination of garba and raas has become very popular at the collegiate level in the United States. Garba-Raas competitions are increasing in number. Popular ones include Dandia Dhamaka, Raas Chaos, Garba With Attitude, Dandia on Fire and Maryland Masti among others. Tippani Dance: Originated from the chorwad region of Saurashtra, laborer women take a wooden rod to beat the floor,which had iron/wood piece at one end, to make it stronger in opposite rows,which made the dance an interesting work.